Super Bowl Champions the Green Bay Packers visited President Obama at the White House today. For Bears fan Obama, it was a bit of a heart-break, but for Packers fans, it was a visit a long time coming. While at the White House today, Packer Charles Woodson presented the president with a certificate of stock in the publicly owned Green Bay Packers. As a Bears’ fan, Obama took the opportunity as a new “owner” to suggest a trade for Aaron Rodgers. Considering I’ve usually heard of teams giving the president a jersey, I thought the stock certificate was a pretty cool gift. It made me wonder what other gifts teams have presented to the president. 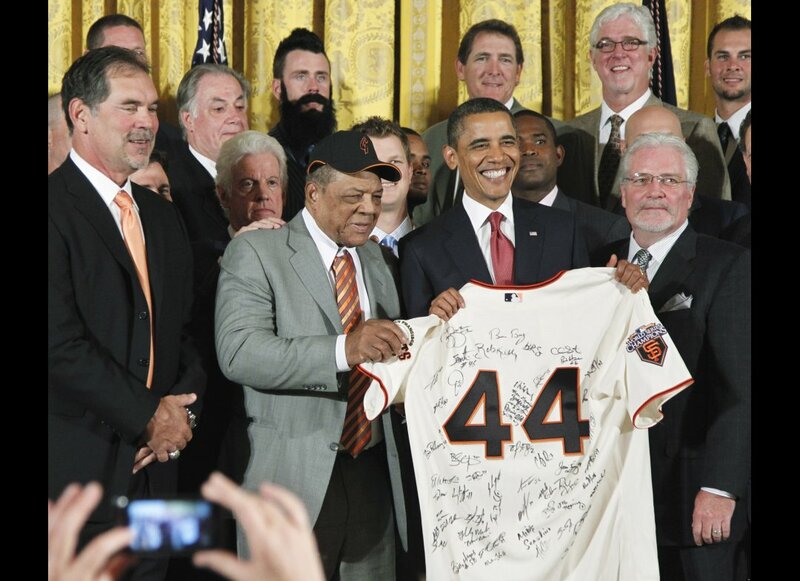 The Giants also gave President Obama a signed bat and fielder’s gloves for his whole family. 2009 World Series Champions the New York Yankees don’t appear to have given any gifts other than the jersey, but their jersey had the #27 on the back – for their 27 world titles. Chicago Blackhawks, the 2010 Stanley Cup winners, gave hometown president Obama a Blackhawks sweater and let him try on the ring. Auburn, 2010 National Football Champions, gave Obama a jersey and a helmet. The jersey the 2009 Stanley Cup Champion Pittsburgh Penguins upped the jersey ante by giving Obama one with a captain’s “C” on it. UConn, the men’s basketball national champions, gave President Obama a basketball with his name etched on it. The Philadelphia Phillies, who won the World Series in 2008, also gave Obama a baseball. As far as I can tell, 2008 and 2008 winners the New York Giants and New Orleans Saints stuck to the jersey gift. Not a gift, but when the UConn women’s basketball team visited in 2009, President Obama challenged a few of the players to a game of P-I-G. Naturally, he won. But the women were wearing heels and dress. The Detroit Red Wings, 2008 Stanley Cup Champions, gave George Bush Jr two jerseys – one #43 for him and one #41 for his dad. And also invited them to visit on their annual father-son trip. They also gave President Bush a miniature Stanley Cup statue. So maybe I’m a little biased, but I think the stock certificate might have been the coolest gift in recent memory. The Packers also broke tradition by giving him a Packers jersey with the name on back “Commander In Chief” and the #1. This entry was posted in Chicago Blackhawks, CuteSports, Detroit Red Wings, Green Bay Packers, New Orleans Saints, New York Giants, New York Yankees, Philadelphia Phillies, Pittsburgh Penguins by nmhaase. Bookmark the permalink.